Beary Merry Christmas will still kick off with a DJ at 4pm, with Middle Street closing at 2:30pm. 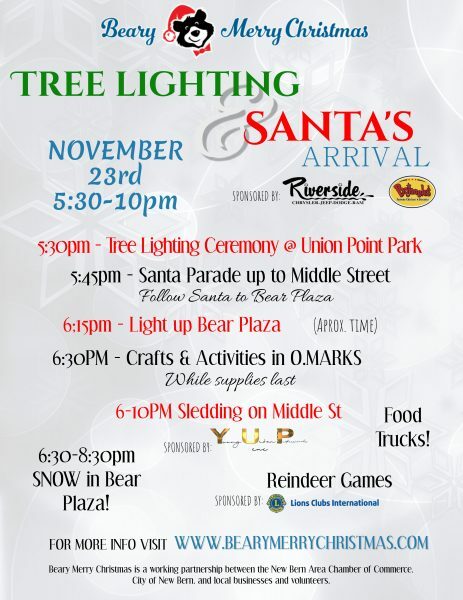 The Community Christmas Tree Lighting will begin at 5:30pm in Union Point Park. Following the tree lighting, a holiday parade will travel from the park to Middle Street where Santa’s Arrival will be shortly after 6:00pm in Bear Plaza. He will greet families until 9:00pm. Families are encouraged to be in line by 8:30pm. Crafts will be from 6:30pm until 8:00pm in the O’Marks building, and food trucks will provide options for those looking for a quick bite to eat during the evening. Sledding will be positioned on Middle Street near the Pepsi Store, located on the corner of Middle and Pollock Streets. Sledding will begin after Santa arrives on Middle Street until 10:00pm. Participants will need to sign a waiver in order to sled.